Step 2: now download the APK of Live NetTV. Step 3: on the BlueStacks interface, take your mouse point to the top left corner where you’ll see three tiny dots next to the installed applications. A pop-up menu will appear with the option to install the APK, press it. Step 4: new use your file explorer to locate the APK of your app and press Open. Step 5: the installation will start in the emulator and as is soon it’s completed, you’ll view its icon amongst the apps available. Press on it to access the contents. If you’ve already got BlueStacks installed on your computer, once you download the APK of Live NetTV you only have to double click on it to install it. Then simply click on any of the broadcasts offered in the app to start the stream in question. 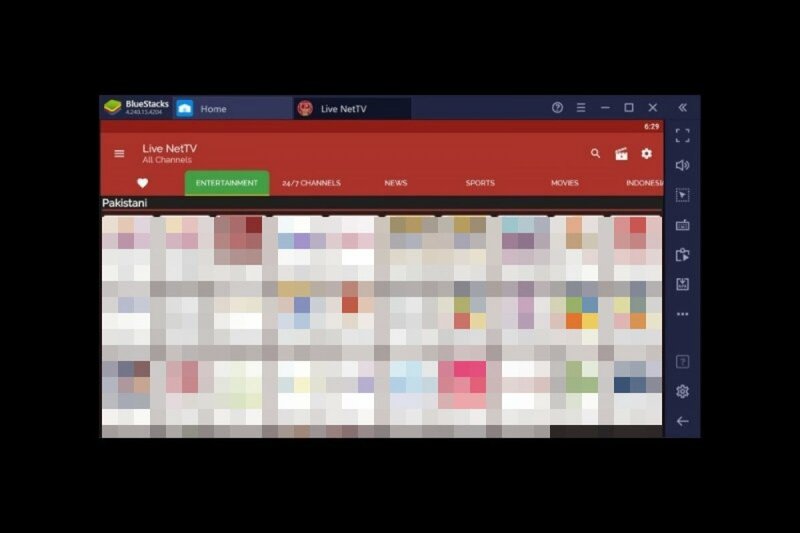 As you already know, Live NetTV is an app that offers us over 800 TV channels sorted into 9 different categories: sports, entertainment, news, movies, documentaries, cooking, music, kids, and religion. The contents can also be organized by countries, and using the app is totally free of charge. Furthermore, the offer grows with each new update and the links to the channels are verified on a regular basis just in case they’ve stopped working. You’ll be able to watch TV online making the most of your computer’s connection and obviously its larger screen size. The only difference is that you can use your mouse to browse through the app instead of a touchscreen.